Karolyna’s first birthday session was a dream. All things girl, frilly, and pink, this girl was so sweet. It was a delight to capture her expressions and delightful nature on camera. 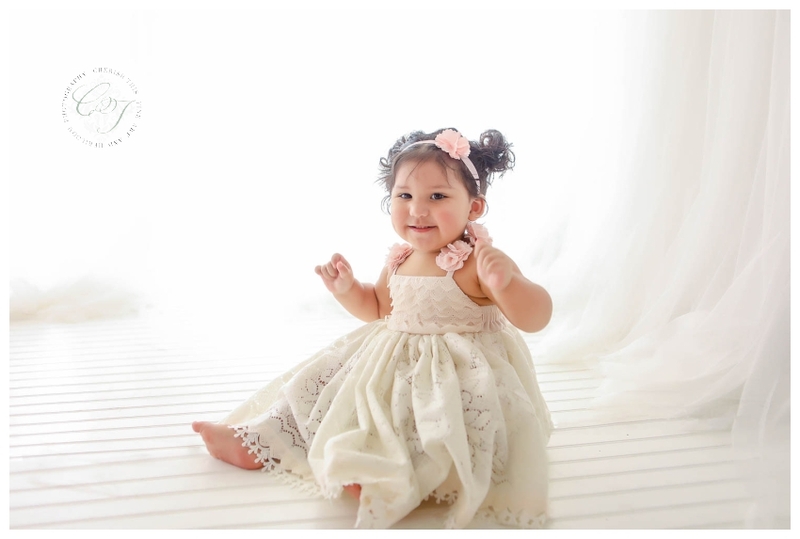 When mom, Karina, contacted me to schedule her baby girl’s first birthday pictures, I just about dropped my phone. I could not believe time had flown by so fast! It seems like just yesterday we were planning the maternity and newborn sessions—or even photos for last Christmas. It’s a sweet benefit of my role as a child photographer that I get to watch as clients grow their families, as parents settle into their roles of mom and dad, and as little ones grow into their personalities and preferences. Time really does fly. I love getting to freeze a few moments of it. Karolyna’s cheeks were to die for. I could seriously squish them all day long. Karina wanted a simple and elegant look for this session, with a side shabby chic. Karolyna’s perfect Dollcake dress, complemented by her cute curls and chubby cheeks gave these images a sassy, timeless, and elegant air—perfect for Karolyna’s similar personality. She even ate her cake like a little lady! The photos of Karolyna in her sweet, white lace dress are precious memories for years to come. Can’t you just imagine one of these framed next to her bridal portrait at her wedding reception someday? Where in the world has the time gone!? As this sweet girl’s Shabby Chic Cake Smash Photographer in Houston, I’ve seen her grow so much in the last year!